Villiers Street, which leads up from the Embankment to the Strand, has always been famous in my mind for Gordon’s Wine Bar which I have visited many times. It’s said to be the oldest wine bar in London, established in 1890 and it’s been family-owned since it opened. Clearly family businesses abound in Covent Garden…who’d have thought? I keep discovering more of them! And this family’s not finished with their Covent Garden plans. The granddaughters of the current generation running Gordon’s Wine Bar have opened their own venture in the same road. Villiers is the brainchild of Rose and Sophie Gordon and serves breakfast, coffee and an informal all-day menu. The bar is laid out with food during the day and in the evening becomes a bar for sitting around. Great idea. We were welcomed with open arms by the charming staff and led into the small, buzzy room behind the bar. The menu’s divided into sections: Snacks, Salad and vegetables, Fish, Meat, Charcuterie and Cheese. Making a logical way to order seem by section, so we did. I like a menu with a bit of logic! 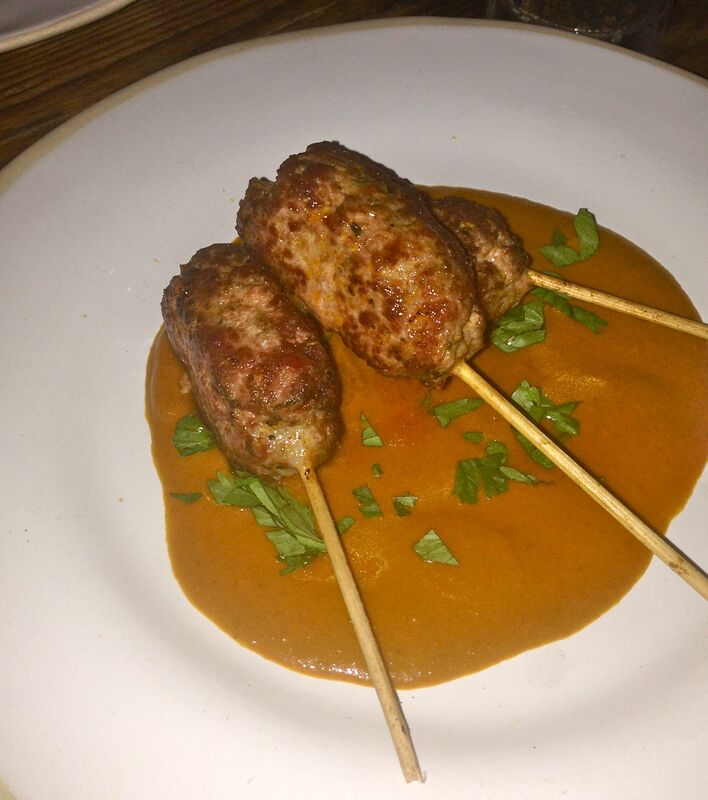 Here’s our selection of tasty morsels. 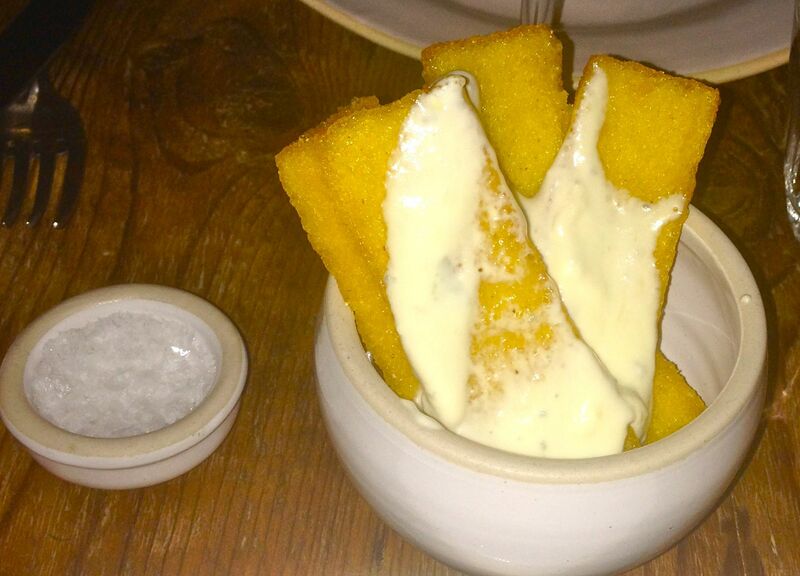 I must try making these polenta chips, they were beautifully golden and served with a creamy, salty gorgonzola sauce drizzled over them. 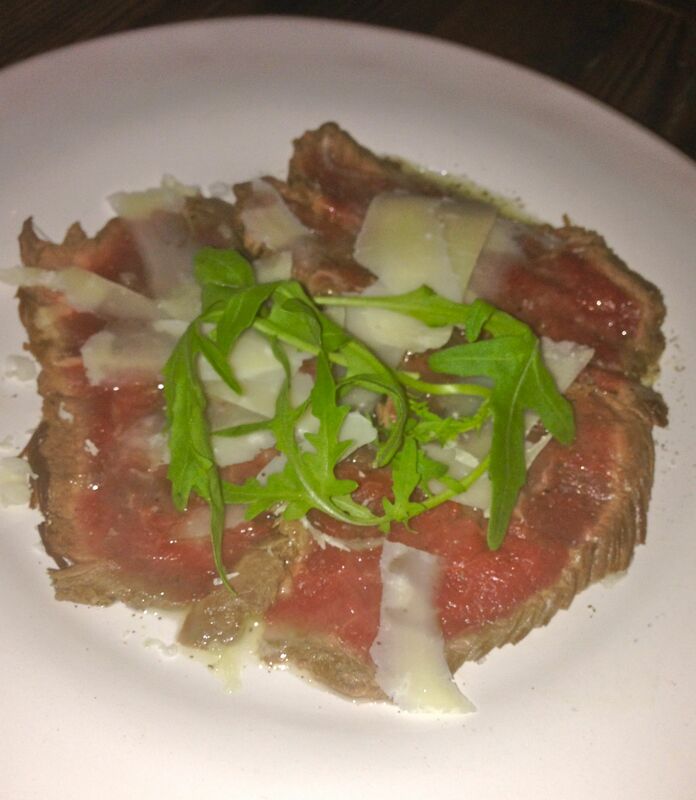 The beef carpaccio was tender and served with the classic combination of rocket and parmesan. Works every time. 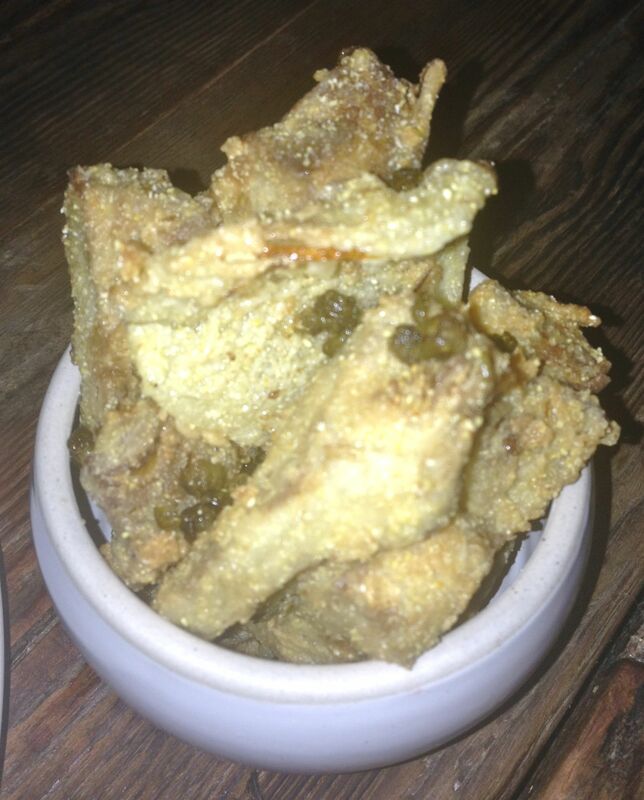 Deep fried artichokes were interesting, sprinkled with crispy little deep fried capers. 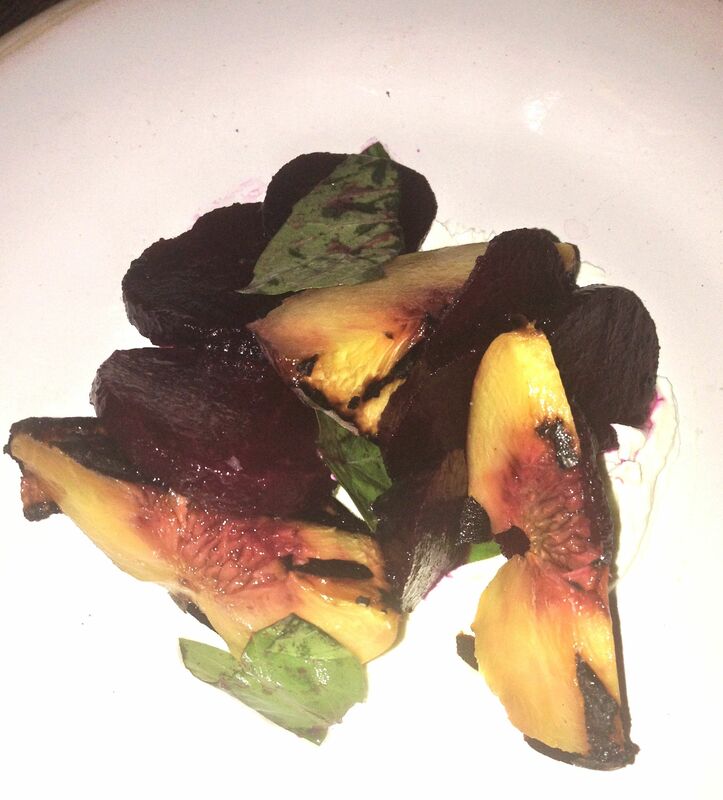 The peach, beetroot and mascarpone salad sounded like such a weird combination that we had to try it! It worked really well together with the beautifully caramelised peaches, sweet and creamy mascarpone and slightly tart beetroot. Portions aren’t huge (but then nor are prices), so we were still hungry. The menus were returned to us and we unanimously decided we should have one of their cheese platters to finish off. A lovely selection to behold. I particularly loved the Stinking Bishop (first on the left), which I’d never had before and was beautifully strong, creamy and stinky and delicious, as only cheese can be! We also managed to polish off some totally delicious Verdejo from Spain, perfect summer white wine. Somewhere else new to frequent in Covent Garden…how delightful.